The concept of the current travelling exhibition (now at the William Morris Gallery until 4-1-2015) is perfectly in line with my own exhibition ‘A Memory Palace of Her Own’. Opposite to the room I occupied a few months earlier yet another room is filled with ‘images of Jane as herself’. Photographs, drawings and paintings are juxtaposed with Jane’s embroidery and handwriting. 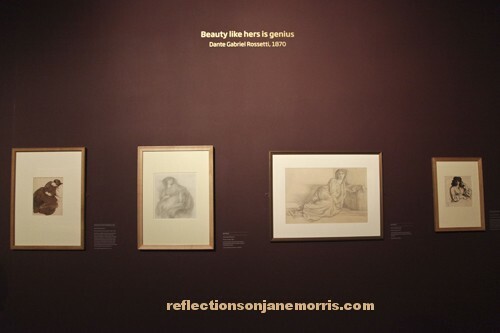 The exhibition offers insight in the relation between Jane as herself and Jane as a muse. 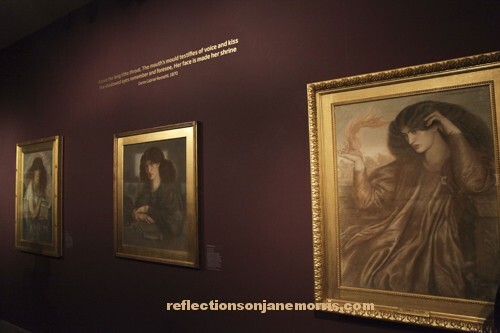 The exhibition illustrates that Jane Morris was multitalented, more than a pretty face. During the opening speech Jan Marsh surprised the William Morris Gallery by donating, on behalf of Frank Sharp, a book with a cover designed by Jane Morris. 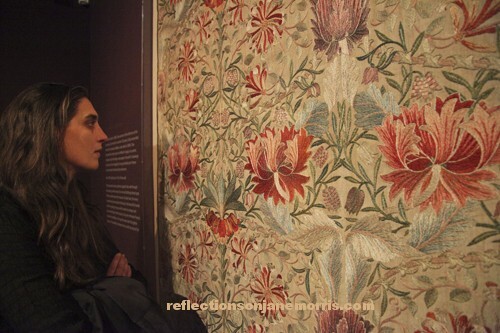 Photographer India-Roper Evans took photographs of the exhibition and noticed me while I was admiring the recently acquired Honeysuckle, designed by William Morris and embroideried by Jane and Jenny Morris. After the private view of the exhibition Kirsty Walker accompanied me to visit Kelmscott Manor. They currently exhibit the Centenary Exhibition; photographs that were exhibited at the National Portrait Gallery earlier this year. At Jane Morris’ grave I have paid my homage to Jane even though she lives on in my mind… You can read Kirsty’s review of our trip here. Excerpt from an email I received from the curator of the William Morris Gallery, Carien Kremer: ‘We would like to offer you a slot in our 2014 programme, showing the photographs in the Discovery Lounge…It would be great to mark the commemorative year with a contemporary take on Jane’. What are you proposing to display? A series of four self-portraits. I visited several of Rossetti, Jane and William Morris’ former homes and took staged photos on location with the photographer Hein van Liempd. 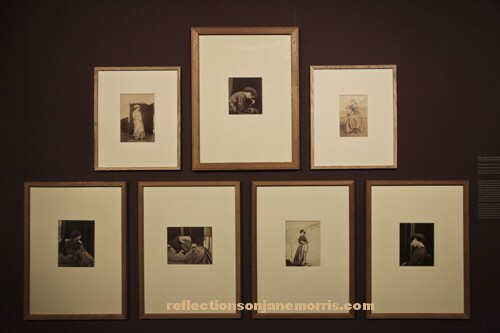 Referring to Jane Morris’ life story I transformed her world into my own, adopting contemporary clothing and poses. How is your work relevant to the William Morris Gallery? The William Morris Gallery is one of William Morris’ two former homes included in my series ‘A Memory Palace of Her Own’. The other, Red House, was designed exclusively by William Morris and Philip Webb, who collaborated in the design of the ‘Green Dining Room’ which is also shown in my series. Are there parallels with the collection? I took photos at Rossetti’s studio, as this is the location of the famous photo series of Jane Morris which was the incentive for my own project. In the archives of the William Morris Gallery I have studied the reproductions of this series. 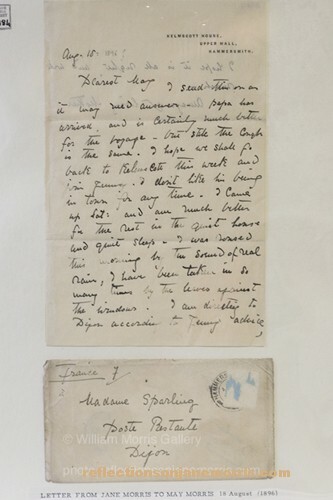 There, I also enjoyed the privilege of reading Jane’s letters. I have incorporated her handwriting in my photo of the Red House. Why is it of interest to our visitors? In the course of my trips to London and Oxford I have seen many inspiring works of art and artefacts from various museums, archives and from one depot. In my work, I often refer to these objects or quote from the many works on the Pre-Raphaelites. 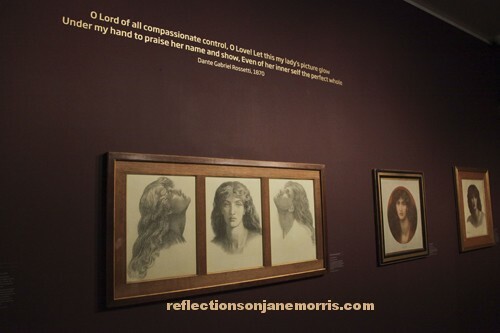 As an artist, it is my hope that my personal viewpoint will supplement the existing works of art and artefacts in the William Morris Gallery to contribute to Jane and William Morris and Rossetti’s cultural heritage.